by Dave from The Longest Way Home ~ May 23rd, 2018. Published in: Travel blog » Nepal. 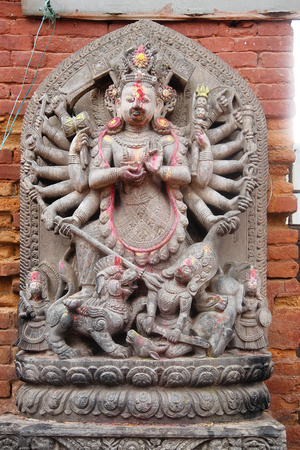 As tales go in Nepal the one about the Ugrachandi and Bhairab statues has been one that has stayed popular for the past 300 or so years. It’s a short one (no pun intended) that shows the rivalry of the Malla kings was not as honorable as they are often made out to be. 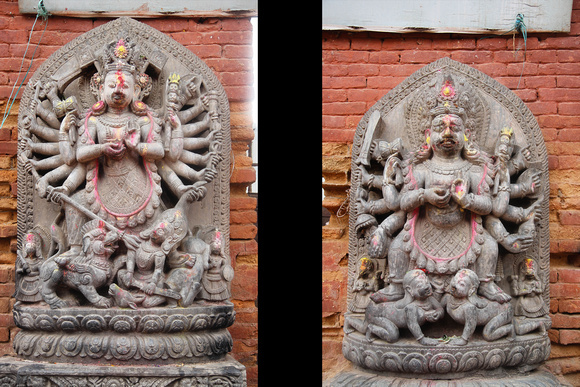 To visit these statues is easy and free if you are in Bhaktapur Durbar Square. 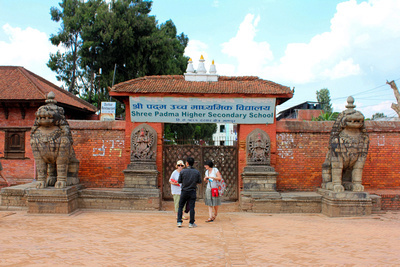 They are located in right beside the ticket office into the main Bhaktapur Durbar Square area. Just walk 10 feet and turn to your left! Two huge stone lions stand outside an old gate along a red brick wall. The gate used to lead into an older part of the royal palace here. But the buildings are long gone since the 1934 CE earthquake. Instead you might be asked for your school pass as the area now contains a secondary school. On either side of the outer entrance wall is what we are looking for. Two stone pillars which have a statue mounted on top of them. To the left is Ugrachandi and to the right is Bhairab. Without getting into the intricate history of the Malla kings lineage this story revolves around their “artistic rivalry”. Before there was “Nepal”, the Kathmandu Valley was a unique places largely ruled by three Kingdoms. Kathmandu (Kantipur), Patan (Lalitpur) and Bhaktapur (Bhadgaon). The kings and their lineage fought constantly. It was more bloody and ferocious than any guide will ever tell you. Instead they’ll focus on one of the more peaceful past-times of the kings. Artistic rivalry. It boiled down to “If you can make something nice, I’ll make something nicer”. This is largely how each of these royal capitals became renown for their artwork, buildings and temples. The same ones you visit in Nepal. In the case of the Ugrachandi and Bhairab statues, the story unveils quite how far the kings would go to be noted as “the best”. In 1707 CE King Bhupatindra (1696 to 1722) commissioned the sculpting of the goddess Ugrachandi. While a lesser known goddess, she is the goddess of nearby Banepa and some say an incarnation of Durga. The Ugrachandi Statue in Basantapur Chowk with 18 arms! The result of the stone masons work is clear to all. The statue of Ugrachandi is truly intricate, detailed and stunning. The eighteen-armed goddess is depicted dispatching a fallen enemy with her trident and a guardian lion. King Bhupatindra also thought the statue was beautiful. In fact he was so impressed with the stone masons work he didn’t want any of the other kings within the Kathmandu valley to have a statue like it. So, he chopped of the masons right hand. End of story …. maybe, not. To the right of Basantapur chowk entrance is a fierce looking Bhariab statue. 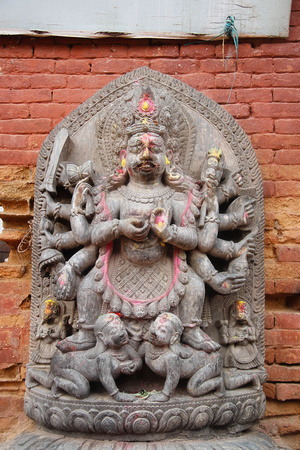 Depicted in his twelve-arm pose, complete with beheaded enemies, Bhairab is known as a “terribly fearsome form”. If you are on his side however, this fearsome form will protect you from enemies, greed, lust and anger. Interestingly Bhairab also appears in Buddhism as a fierce form of Manjushri. The Bodavista who was meant to have drained a lake and so the Kathmandu Valley was formed. But, that’s another story. 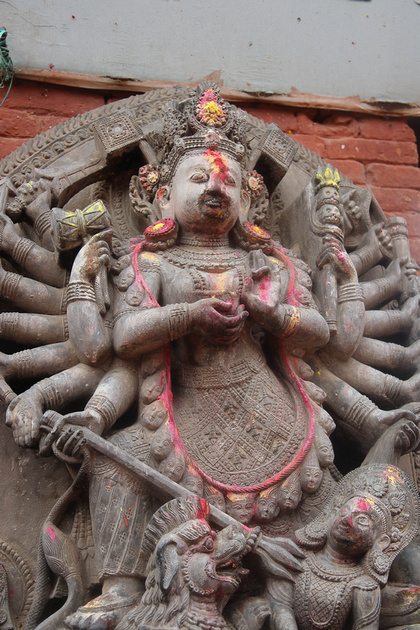 The Bhairab statue in Basantapur Chowk in Bhaktapur … a statue that cost the sculpture his other hand! Remember the stone mason who lost his hand sculpting the nearby Ugrachandi statue? Well, he created the Bhairab statue by himself a little later on. The story goes that King Bhupatindra found out and promptly removed the sculptors left hand. We don’t know if the sculptor ever tried or could make anything ever again. Presumably not. While the artistic rivalry of the former Malla kings is often said with a sense of pride there is a lot more to history than just what was left behind. The Kathmandu Valley was largely isolated for many years with these kings battling each other both physically and in the arts. Ugrachandi and Bhairab Statues in Basantapur Chowk side by side … the legacy of a king or an artist depending on how you look at it! There’s no doubting what they left behind is a stunning collection of artwork and buildings. However, the next time someone says “This was made by King …” do consider it was most likely not the king himself who sculpted or made it. Moreover, the person who did sculpt a statue may not have been able to make anything else thereafter! Or in this case, they tried for either love or money and lost their hands. The one thing they do have that many artists don’t have from back then is a story that may well outlast the statues themselves! Thanks. The statues are in Bhaktapur but yes, the place can indeed remind you of Kathmandu as a whole. Do we know the artists name? Nobody does it seems. A same not just due to the work but also the story. Wow, from two statues such a story. Nice. Not sure it was nice for the artist! Well, he did live so there’s that. Fascinating story. It’s something that is indicative to South Asia. Artists from the past are forgotten and only the rulers remembered. Yes, I looked into this phenomena. A lot has to do with the specific ruling entity. Some were happy to show they had famous artists, others wanted the rulers to take credit. I think and hope that as archeology improves along with technology we may in the future uncover more about these artists. I really enjoy learning about things like this. I do wonder they these artists never even made a little scribble under or behind the statues with their names? This is a great point Amy. In many inscription pillars a lot is written down. But rarely, again, and artists name. Usually it’s the king or donor who is mentioned. It would be very interesting to see if an “artist” did indeed leave their mark somewhere on the statue. That said, who knows. Maybe there were inspectors who checked these things back in the day. In China we kept records of our artists. We were proud of them. Glad you mention. The Kathmandu Valley blossomed in relative isolation. It created an artistic rivalry led by royal brothers that created artistry not found elsewhere in the world. Each country has a different history. Bhairab looks like he’s upset? I don’t think there’s a smiling Bhairab anywhere! He’s generally seen as fierce. I’ve several photographs of these statues and I think the ones posted here captured some dye that was placed on the statue which has given him a slightly upset look too! I confess! I never saw these when I was in Bhaktapur. I would have loved to sketch them. I sketched the Siddhi Laxmi one just before it was taken down for repair. Siddhi Laxmi must have made a great Sketch! I know Nepali students used to sketch Vatsala Durga a lot too. The statues would make a fine addition. Such an interesting story. I never even thought about it before which makes it even more interesting. Can’t wait to seem them! Thanks Dave! You’re welcome. They are a nice story and lovely statues which are very easy to visit. They are both so stunning. May I ask if you have digitally preserved them? Not yet. They should be though. Thanks for the heads up, they are now on the list. The Ugrachandi statue is particularly well done. The Bhairab looks a little different to the standard Bhairab type. Possibly understandably since the sculptor only had one hand to do it. Is is true that she was the consort of Bhairab? Bhariab has many forms. There is one statement linking him with Ugrachandi but generally speaking within the Newari settlments Bhairab’s consort is the Balkumari. In south India it is the Goddess Bhairavi however she is linked to Shiva in other continents. Yes I agree, there may once have been records but nearly every statue back from that period would have been attributed to the king or the donor rather than the actual artist. Absolutely stunning. Definitely one for my list when we return to Nepal.